The deadline for the Agribusiness Leader and NAMA Marketer of the Year awards has been extended to January 22. 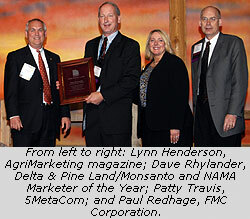 Both awards will be presented at the 2009 Agri-Marketing Conference, April 15-17 in Atlanta, Georgia. 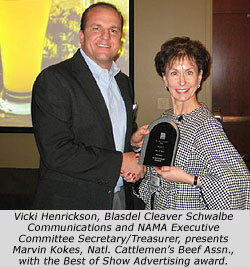 Fill out the nomination form on-line now at http://www.nama.org/awards/agribusinessform.htm. Download the Agribusiness Leader Nomination form in an Adobe .PDF format by visiting, http://www.nama.org/awards/agbusapplication.pdf. Fill out the nomination form on-line now at http://www.nama.org/awards/namamarketerform.htm. Download the NAMA Marketer of the Year nomination form in an Adobe .PDF format by visiting, http://www.nama.org/awards/mktrapplication.pdf. See the Hot Ideas and Sizzling Solutions of 2008 by attending a regional or chapter Best of NAMA Event near you. 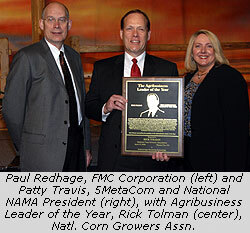 The Region III Best of NAMA Ceremony will take place on January 15, 2009, at the Stoney Creek Inn in Johnston, IA. Cost for the event is $65. A block of rooms has been secured at the Stoney Creek Inn. To book a room, call 1-800-659-2220. The Region IV Best of NAMA ceremony will take place at the Chicago Marriott Northwest, 4800 Hoffman Blvd., Hoffman Estates, IL 60192. Cost is $75 per person. 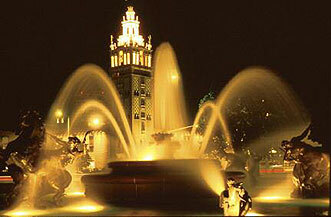 For hotel reservations, call the Marriott at 847-645-9500. To register for a regional Best of NAMA Event, please visit: http://www.nama.org/amc/bon/register.htm. Please join us on Thursday, January 22, 2009, at North Carolina’s first LEED (Leadership in Energy and Environmental Design) designed restaurant, Mez Contemporary Mexican Restaurant, as we toast another great year of “well done” local campaigns. Our Best of NAMA Regional winners will be announced and we’ll cheer on those advancing to the national awards ceremony. To register online visit, http://payment.nama.org/carvir.html. This year, we have reserved a suite at the FedEx Forum for all of us to enjoy a Memphis Grizzlies game! Instead of the usual, we thought an entertaining outing would be more fun, with the focus not on the awards, but on each other. So, please make plans to join us as the Grizzlies take on the Denver Nuggets, Tuesday, January 27. We’ve reserved one of the great suites at the Forum and will be serving food and beverages before and during the game. Plus, we’ll have our local winning NAMA entries on display. Please RSVP by January 20 to http://survey.archermalmo.com/TakeSurvey.aspx?SurveyID=88K2882. Maximizing Your Trade Show R.O.I. Don’t miss the next NAMA Webinar, Maximizing your Tradeshow R.O.I., on Thursday, February 5th at 1:00 p.m. central time. Our speaker will be Scott Hanna of Skyline Displays. What do you do at a trade show? Now, more than ever, your tradeshow marketing program must generate sales and profits. Scott Hanna with Skyline Displays will help you get results by revealing the essential aspects of a successful tradeshow program. To register for the February 5th webinar, visit http://payment.nama.org/webinar.htm. Note: If you sign up for a Trade Show Booth at the 2009 Agri-Marketing Conference in Atlanta by February 4 you will receive a complimentary registration for this webinar! Every year at the Agri-Marketing Conference, professionals involved with selling products and services into the agricultural marketplace gather to explore the latest in techniques, trends and practices. Note: Exhibitors who sign up for a booth by February 4 will receive a complimentary registration for NAMA’s February 5th webinar on Maximizing Your Trade Show R.O.I. with Scott Hanna, Skyline Displays. For more information on this Webinar visit http://www.nama.org/programs/webinars.htm. After careful review, the NAMA Executive Committee has announced that the annual Agri-Marketing Conference will be held in Kansas City the next four years. The committee cited two primary reasons: member satisfaction and cost control. Historically, member participation has been stronger at Kansas City conferences, both in terms of delegate registrations and student competition. This is due in part because its central location makes the city a convenient and affordable travel destination from virtually anywhere in the country. It’s also because Kansas City is an attractive city to visit as is reflected by its scores on conference surveys, consistently higher than any other conference location. In addition, the committee felt that recent investments in the downtown area – including the Power and Light District – will make Kansas City an even more stronger conference venue in years to come. In the current economy, cost is an obvious concern in conference planning. As already noted, the city compares favorably in terms of travel and lodging costs for attendees. These benefits apply to the organization of the event as well. Meeting rooms are more affordable as are freight and handling costs for trade show participants. And, by committing to a multi-year contract, the committee was able to lock in even more favorable rates. If you have feedback please feel free to contact Jenny Pickett at the national office, 913-491-6500, jennyp@nama.org. You may know that your Midsouth NAMA Chapter supports students from Mississippi State and University of Tennessee-Martin in their quest to win the national student marketing competition at the annual meeting in April. This year, however, the Midsouth chapter is giving each team a little extra help: a crash course in NAMA Student Marketing Competition 101! And we need your help. Next week, both teams will be coming to Memphis to introduce the initial ideas for their products and hope to get feedback from professionals like you! the other team will meet a “presentation team” — students will be able to review videos and Executive Summaries from previous national finalists and will be able to brush up on general PowerPoint and presentation skills. If your schedule allows, join us next Wednesday at archer>malmo to help meet with the students and set them on the road to victory. You can be a part of the evaluation panel or the presentation team — your choice! And if you can’t make it the entire afternoon, we still appreciate any time you can spare. If you can help: contact Megan Klein (mklein@archermalmo.com) or Brad Allen (allenb@helenachemical.com) for details. Thanks for your help…we know the students will appreciate your support! Over 30 Badger NAMA Members gained an inside perspective from Mark Gale, Managing Partner of Charleston|Orwig, on November 19 at the Radisson Hotel in Pewaukee, WI. Gale explained what it was like to have his son, Garrett Weber-Gale win two gold medals at the 2008 Summer Olympics in Beijing, China. Gale shared stories and photos and discussed how the Olympics affected their family. Gale also provided insight on advertising, promotion and sponsorship of the Olympics and Olympic athletes. Nearly 110 people gathered at the Boulevard Brewing Company in Kansas City on January 8 for the Region II Best of NAMA Ceremony. Hosted by the MoKan chapter of NAMA, the event honored the best work of the Rocky Mountain, Midlands, Gateway, Great Plains, Southwest and MoKan Chapters. The region had 428 entries (up 24 entries from last year!). All regional Best of NAMA winners will be listed on the NAMA web site after Feb. 1.